For commercial customers, we offer a number of financing options, including a risk-free hire purchase option. 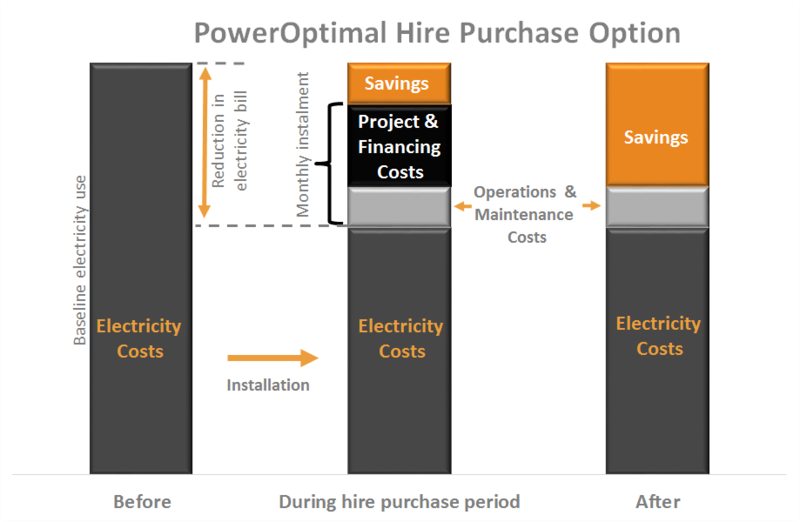 After an assessment of your electricity use patterns, we do a cost-benefit analysis to determine whether sufficient cost savings can be realised. We then provide an estimate of the savings that can be realised, and if you decide to go ahead, you can buy the system on a hire purchase basis, with the monthly installment guaranteed to be lower than your savings. This means that you are never out of pocket! Contact us to discuss this and other financing options. How are the actual savings determined? The treatment of variations in use (e.g. installation of new energy-efficient equipment, or expansion of your operations) is agreed upfront, using an approach such as the IPMVP (International Performance Measurement & Verification Protocol).